Two franchise clubs have reported for the final game of the Winter 2015 series ~ K9 Manners & More (Broken Arrow OK) and In Contact Dog Training (Springfield, IL). You can view those results here: Dec 2015 Results. The Clermont County All Stars (Milford, OH) still holds the lead. Three clubs have not yet reported. ClickerPets Mexico (Zapopan, Jalisco, Mexico) has forfeited due to scheduling difficulties in a hectic month. All results are due by midnight, December 31, 2015. We welcome all new clubs who would like to establish league franchises. The National Dog Agility League stands apart from most agility organizations in the world. This is not a titling organization; and it’s really inexpensive to play. Think of it this way… The National Dog Agility League is the only world-wide competition to which all dogs are invited. You can download the score-keeping worksheet for final game of the Winter 2015 series here: Scoresheet. This is the final game of the 2015 winter series. It is a simple (?) 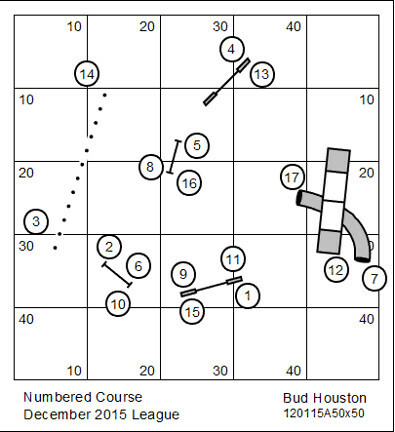 numbered course that is scored Time, Plus Faults. Nov 2015 ResultsA few franchise clubs have reported for the final game of the Winter 2015 series. You can view those results here: Dec 2015 Results. The Clermont County All Stars have moved into the lead. Six clubs have not yet reported. K9 Manners Reports ~ Nov 2015 NDAL in the Books! K9 Manners has reported results for the first game of the winter 2015 series of the National Dog Agility League. You can view those results here: NOV RESULTS. The results include the final team standings for the first game of the Winter 2015 series. The top three scoring clubs were: Sit, Stay, ‘N Play in Stroudsburg, PA, scoring 575 LPP; Clermont County All Breed All Stars in Milford, OH, scoring 569 LPP; and Team Canada in Edmonton, Alberta Canada, scoring 512 LPP. A briefing for the game “Time Stands Still” is included below. The December game will be published later today! The use of YouTube recordings of each player in this competition has broadened considerably. It is fun to watch other players in far-flung places play the game. There’s a learning curve… for example, the “Shortlink” to the recording is preferable to the full url. And it fits better in the data record. We didn’t grow in November. Weather, health & holidays apparently got in the way. And, we’re still working at enticing new clubs and players. Growing something new and different is difficult in this age of plenty. But ours is a different model. Think about it… this is the only world champ venue to which everyone is invited. Our chief interest at this time is establishing those franchises that will go forward. For the first time we are getting a lot of buzz from social media. When you share (or even like) it gives the NDAL exposure to your many friends who might want to join in the fun. Ostensibly this is a simple follow-the-numbers game. However, the game has special rules for timing. When the teeter has tipped (and is touching the floor) the time will stop. OPnce the dog leaves the ramp, time will begin again. Note that initially time begins with the dog first dismounts the teeter. Time Stands Still is scored Time, Plus Faults. Clermont County All Breed All Stars in Milford, OH and Team Canada in Edmonton, Alberta Canada have reported results for the first game of the winter 2015 series of the National Dog Agility League. You can view those results here: NOV RESULTS. We’re not quite ready to call an end to the November competition. I expect results from at least one more club this evening. Final results will roll out tomorrow. If you have interested in jumping into League Play, the November workbook for the first game of the winter series can be downloaded HERE. We’ll be accepting results for this event through the end of the day, November 30th. Ostensibly this is a simple follow-the-numbers game. Howwever, the game has special rules for timing. When the teeter has tipped (and is touching the floor) the time will stop. OPnce the dog leaves the ramp, time will begin again.